A quick pan sauce of capers, lemon juice and butter naps seared turkey cutlets. Rosemary-roasted potatoes are served alongside. Toss the potatoes with 2 tablespoons of the olive oil, the rosemary and garlic in a medium bowl. Season with salt and pepper. Spread the potatoes in a 13- by 9-inch baking pan. Roast, uncovered, stirring once or twice, until browned and tender, 25 to 30 minutes. Sprinkle 1 teaspoon salt and 3/4 teaspoon pepper on both sides of the turkey cutlets. Heat 2 tablespoons of the olive oil in a 10-inch nonstick skillet over medium-high heat until hot. Sear 2 turkey cutlets, turning once, until browned and cooked through, 1 1/2 to 2 minutes per side. Remove to a plate. Add the remaining 1 tablespoon olive oil to the skillet, cook the remaining 2 cutlets and add to the plate. Add the capers and the lemon zest and juice to the skillet, swirling the skillet to combine. Remove from the heat, add the butter and stir until a thick sauce forms. Stir in the parsley, adding any juices from the resting turkey, and season with salt and pepper. 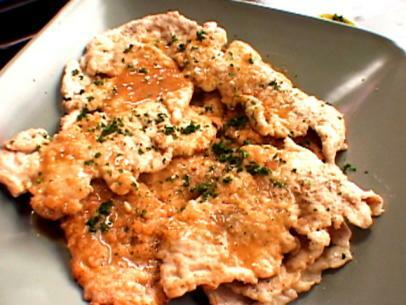 Divide the turkey cutlets among serving plates and spoon the sauce on top. Serve with the potatoes. Copyright 2011 Television Food Network, G.P. All rights reserved.